It’s not like we decide to have children in order to screw them up, to make their lives miserable and ruin any chance of happiness for them. And, it’s not like we wish the worst of the worst to come to our children, like some black curse spat out into a cauldron. It’s just not like that. The fact of the matter is that the majority of us were created by our parents, in the name of love. The hopes of a life better than what any parent has survived is what they intend for us; their little bundles of joy. The fact of the matter is, though, is that the best that each parent could bring to their role as a parent rarely meets the demands of each child. Life is so big. The complexity of even one human life is a lot to be with. How do any of us really know what our children need or want from us? 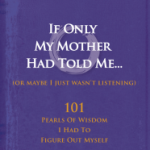 May this little book remind you of the many pearls of wisdom you may have heard along the way, from parents, grandparents, teachers, siblings, or those you just discovered for yourself. And, perhaps there will be some you will gladly pass on to your children, if they are listening.